St Mary's Church/Eglwys Santes Fair at Gwydir Forest Park (NRW)0300 065 3000work Walking RouteSt. Mary’s Church (Eglwys Santes Fair) is the starting point for the Llyn Elsi walk into the surrounding woods, lakes and mountains. This trail starts on the forest road behind St Mary’s Church in Betws-y-Coed. It follows this road to woodland where the route is then waymarked to Llyn Elsi. The path goes around the lake with views of the island that supports nesting seagulls and geese and the Carneddau Mountains.. You can download a leaflet for this trail from the Natural Resources Wales website. Pont y Pair car park is operated by Conwy County Borough Council. There is a parking charge. Pont y Pair car park is at the junction of the B5106 and the A5 in Betws y Coed over a narrow bridge. The nearest train station is in Betws y Coed. 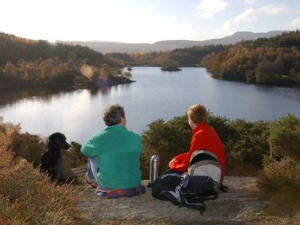 Two walkers and a dog take time to study the view of Llyn Elsi Gwydir Forest from the monument. St. Mary’s Church (Eglwys Santes Fair) is the starting point for the Llyn Elsi walk into the surrounding woods, lakes and mountains. The OS grid reference is SH 795 566.